"Punch N Cut" is a compact lightweight all around irrigation tool. 10" long x 1" wide x 2" high. 4 oz. Polycarbonate body with a 440C Stainless steel blade, a stainless steel punch pin and polyurethane emitter holders. 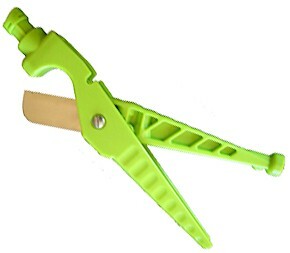 The Punch N Cut is the greatest, all around drip irrigation tool available. It has a spring loaded stainless steel punch pin for punching holes into any size drip tubing, an application to install drip emitters or remove emitters without hurting your fingers and the sharpest, longest lasting blade on the market. Cuts poly tubing or soaker hose. Place rotating crescent against tubing. Apply forward pressure until the punch pin pierces the tubing. If larger holes are desired, remove pullet punch cutter from the storage holder on top of the blade handle. Insert emitter or barb in either rear or bottom barb holder. Place emitter barbed point against punched hole in tubing. Apply pressure until the emitter barb pierces tubing. Does not work with all 1/4" barbs or emitters. Install emitter with 1/4" tubing attached into crescent slots on bottom of punch handle. Place shoulder of emitter on outside edge of handle with 1/4" tubing pressed into crescents, place emitter barb against punched hole in tubing. Apply pressure until emitter pierces tubing. Place eased edge on bottom of punch handle against emitter at 45° angle. Apply pressure until emitter edge is lifted and seated into crescents. While holding emitter assembly in crescents rotae tool backward until emitter is removed. Lightly squeeze handles together while roatating them up and down. As tubin cut, reduce pressure and the end of cut.